OLD PARKED CARS. 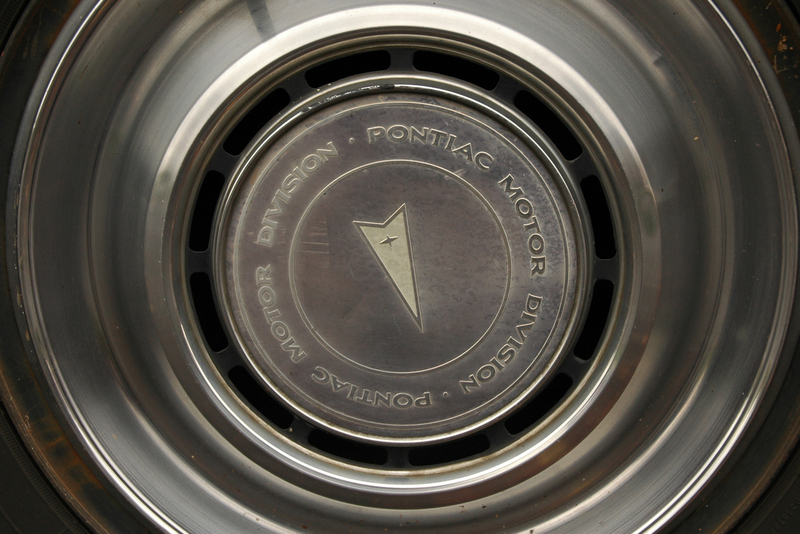 : 1976 Pontiac LeMans. 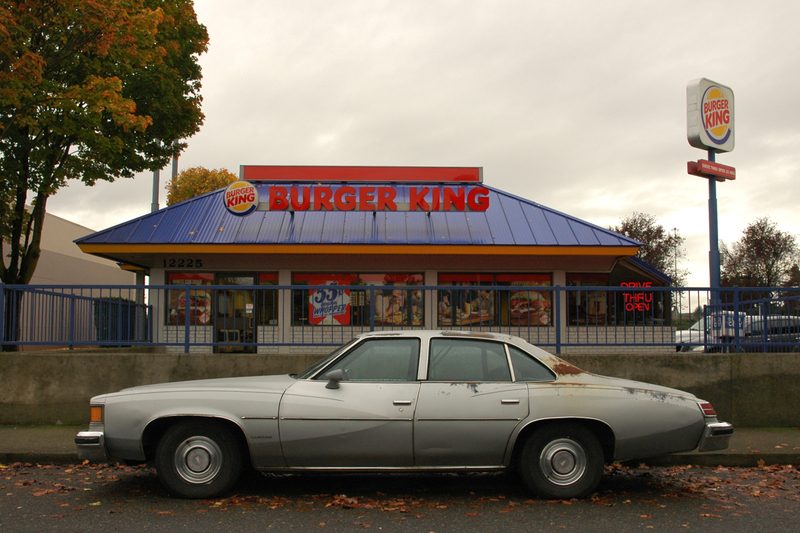 That profile shot showing the staging in front of the burger king is tremendous - wonderful colors and tones. WOW. Overall a very impressive selection of photos. 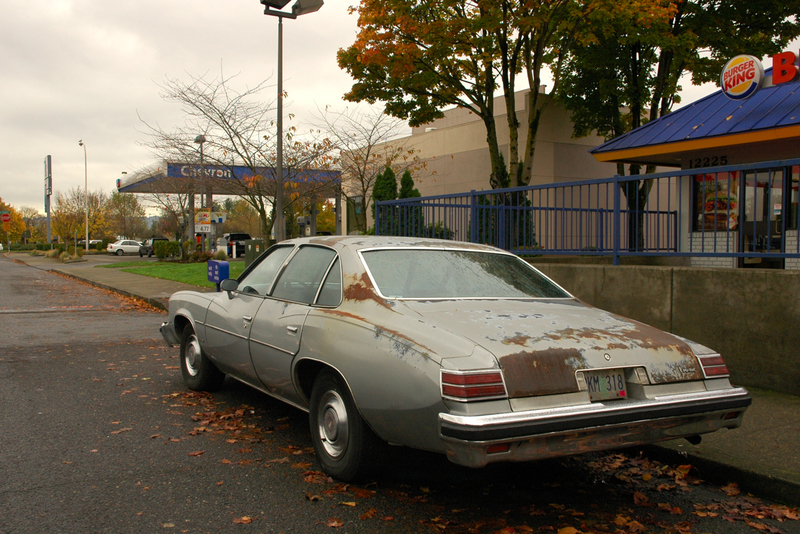 Looks like a car that would be parked in Silent Hill. And to think that monster used to be called an intermediate - wow! Anon nailed it. Also, laughed heartily at the Silent Hill comment. "What we got here is a complete lack of respect for the law. "~Sheriff Buford T. Justice. This was Jackie Gleason's police car (brown color)in 'Smokey and the Bandit'. The family across the street had a brown one of these in their garage in the early to mid 80s. It rarely ever moved, though it's stablemate (a silver '81 Corolla sedan) saw a lot of action. Spot on with the Silent Hill comment! What town is this in and is it for sale? 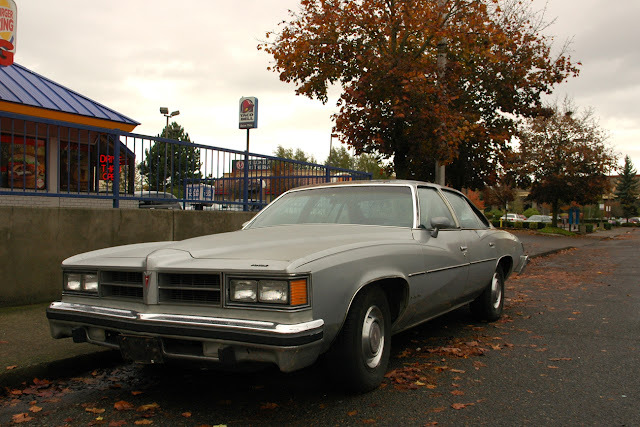 I have owned a '76 LeMans sedan with the rare Enforcer police package for exactly 18 years. I have painted it the same copperish brown with blue interior as the Smokey car, and changed the wheel covers and grilles over to 1977 parts. It's a great handling and driving car that has served me well. I have noticed that these cars have gained some popularity in the past few years, and deservedly so. Compared to some of the 1976 offerings, this car was a lot better. Its funny because this is my car and i left it in jantzen beach for a couple of days and all of a sudden its famous.anyways its not going to look like that anymore its getting a paint job today! Looks EXACTLY like the car that spins out and slides into a giant puddle in the credits on one of the seasons of the A Team.